Taryn Rose's designer shoes are made for comfort and luxurious styles for work or casual wear. Leather suede upper. Lower at back heel. Non-slip outsole for stability. Ann Taylor Camryn Suede Flats. Soft Suede. Pointed Toe w/ Bow. Color: Black. Softspots Blue Leather Suede Shoes Mary Jane Women's 10 WW. Condition is Pre-owned. Shipped with USPS Priority Mail. 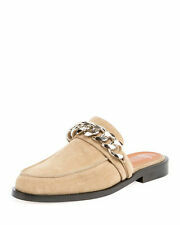 Saks Fifth Avenue Beige Tan Suede Espadrille Mules. Twist design flaunts sumptuous suede. Only beige/tan color available - other color shown only for style. Slip-on style. Black suede slip-on fringe loafers. Features a gold Tory Burch emblem on the front of the shoe. Padded leather insole for comfort. Suede Upper. Material Content. 5in (1.25cm) heel height. Izaac Mizrahi fot Target Suede Pointed Sneakers Size 9. Saks Fifth Avenue Gold Suede Espadrille Mules. Suede upper. Slip-on style. Size 9 fits like 8.5. Condition is Pre-owned. UGG Australia Clogs. Shearling Lining. • Suede exterior. • 3.75” wide across ball of foot. • Leather lining. 5280 AN1 # . Sizing: Runs small; order next size up. Condition: New in excellent condition. - Lace-up style. SIZE: 5.5 M US. Style Civni. Material Suede. Product Details. Heel Height. Gray color and nice condition. Presenting a wonderful pair of "Becky" model black suede gladiator sandals from Gucci. These are the lower ankle version. I also have the higher gladiator ones for sale too. Lightly worn. Soles show a little wear. Bailey Button Poppy Suede Fur Boots. UGG Australia. Stitched UGG logo on heel. Genuine suede uppers with poppy flower elastic button closure. Single button with elastic fasteners on side. Treadlite rubber outsole for durability and grip. 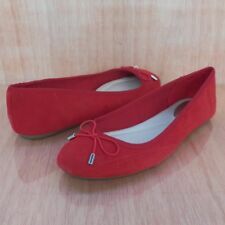 Ann Taylor Women's Camryn Suede Bow Flats - Red - Size 6. Made in buttery soft suede, bow-topped, and Pointy toe. Padded footbed for complete comfort. Covered 1/2" heel. • Suede • Imported Retail: $138 condition is Pre-owned. Shipped with USPS Priority Mail.